Part of the reason for branching out and starting Montague Ede was a chance to do something a bit different, a bit fun and a bit more creative. 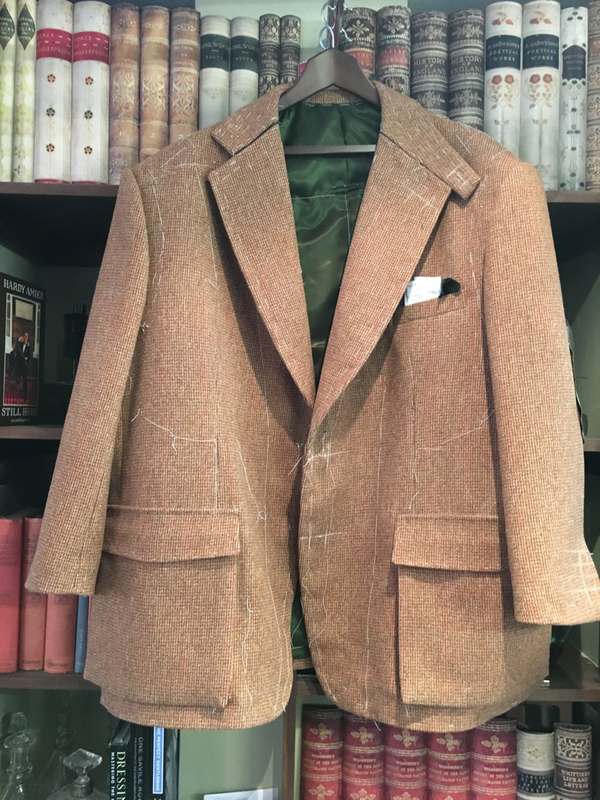 There is absolutely no reason why bespoke tailoring shouldn’t be a bit lighthearted, whether it be creating ridiculous pockets for niche objects or finding the loudest lining ever created for a flash of character on a pocket flap. So when artist Olly Williams (www.ollysuzi.com) approached me to cut him something a bit different, I leapt at the opportunity. Olly had obtained a length of tweed from the island of Jura, which was woven with the surrounding Scottish landscape in mind. The tone of the yarn combined with the ‘rough and ready’ tweed is sympathetic to the environment the cloth is designed to be worn in, and Olly’s request of a shooting coat he could ‘fling on’ and do anything in was perfect. Taking Olly’s frame and the aesthetic he had in mind, we decided to cut the coat with bellow patch pockets, a storm collar and gun pleats at the back. Suede elbow patches and trim on the edge of the pockets in olive green really complimented the piece. Add to that Bernstein and Banley’s shark print lining through the sleeves, and you have yourself a blinder of a coat.